Yerba Buena Lofts at night. 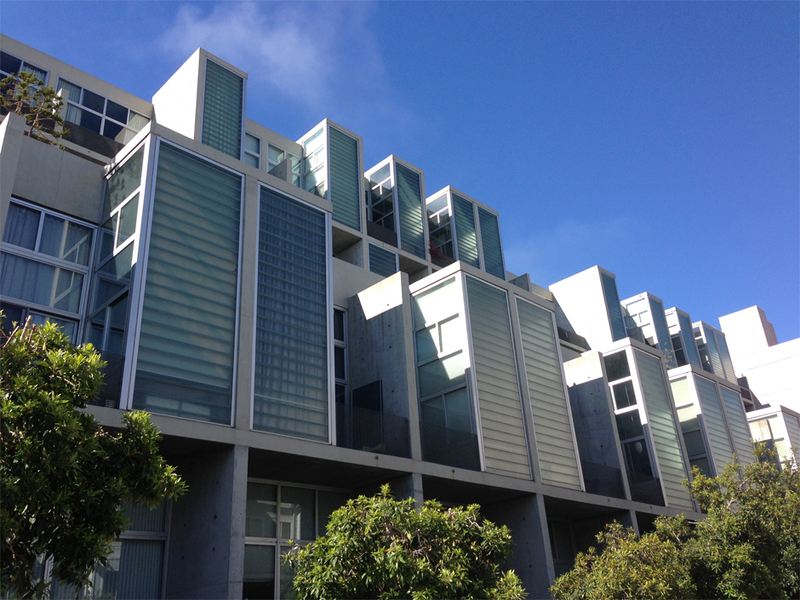 This posting is a love letter of sorts to Yerba Buena Lofts, designed by Stanley Saitowitz. Yerba Buena Lofts is my creative lab, my muse, and for the last year my home. I love the vast interiors volumes, the honest and innovative use of materials, and the location within blocks from downtown (which means there is a lot to do and many options for getting around). The design is bold and precise, and this space has challenged me to consider how to create a comfortable and relaxing home in a hard-edged modern structure. Yerba Buena Lofts as seen from Shipley Street. 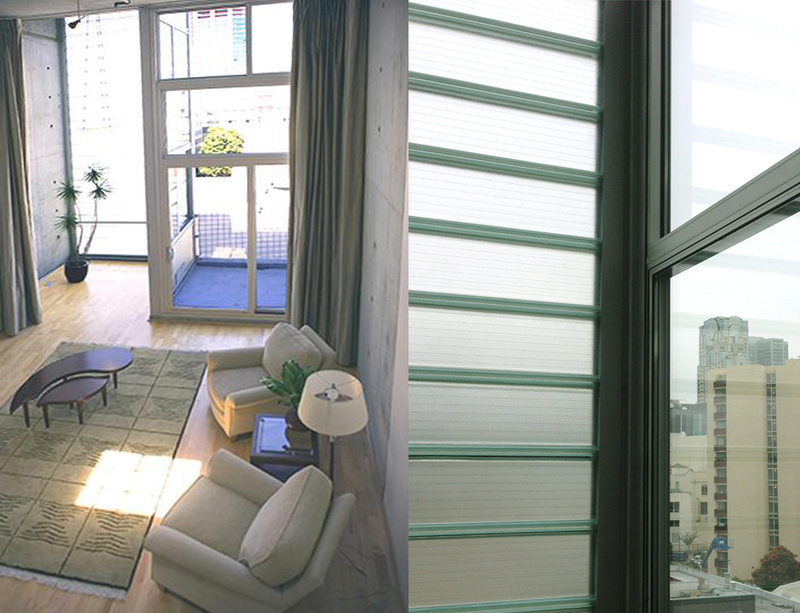 When Yerba Buena Lofts was built 11 years ago, it was at the cutting edge of modern design in San Francisco. In a city full of Victorian houses, change takes a lot more effort. I heard the story of Stanley Saitowitz going to the planning commission, which told him his design looked like a prison. Thankfully San Francisco is changing, and modern buildings are getting built here. Other local landmarks built in the early 2000’s include the Thom Mayne’s Federal Building, Daniel Libeskind’s Contemporary Jewish Museum, Herzog & de Meuron’s de Young Museum, and Renzo Piano’s Academy of Sciences. Concrete and channel glass block construction detail. This building is about concrete and glass. 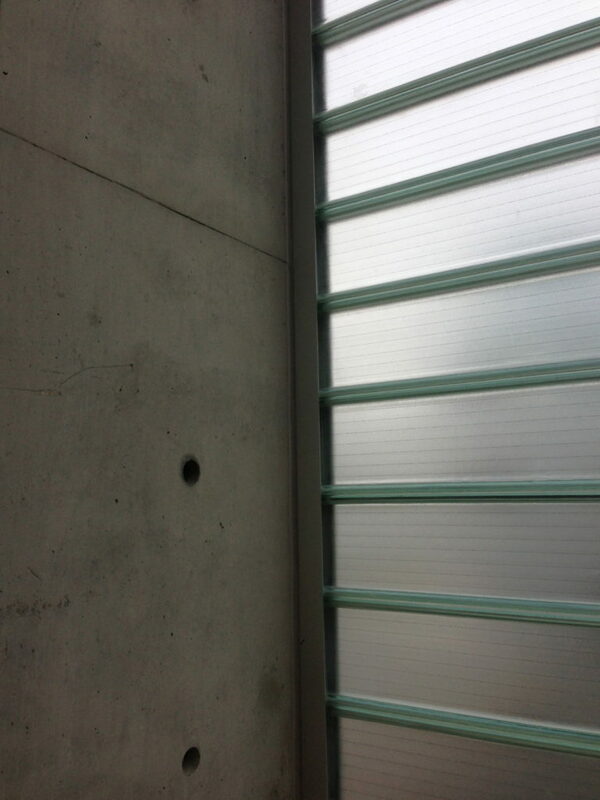 The concrete expresses the structure and the act of construction: impressions of the plywood forms used to contain the poured concrete are visible (think Tado Ando). Because money wasn’t spent to cover up the concrete with drywall, there was money to invest in design, and buy the channel glass. The skin of the building is alternating translucent channel glass blocks and clear windows. These glass walls both veil and expose the interior to the view of the city, providing soft green filtered light, brighter illumination and privacy. 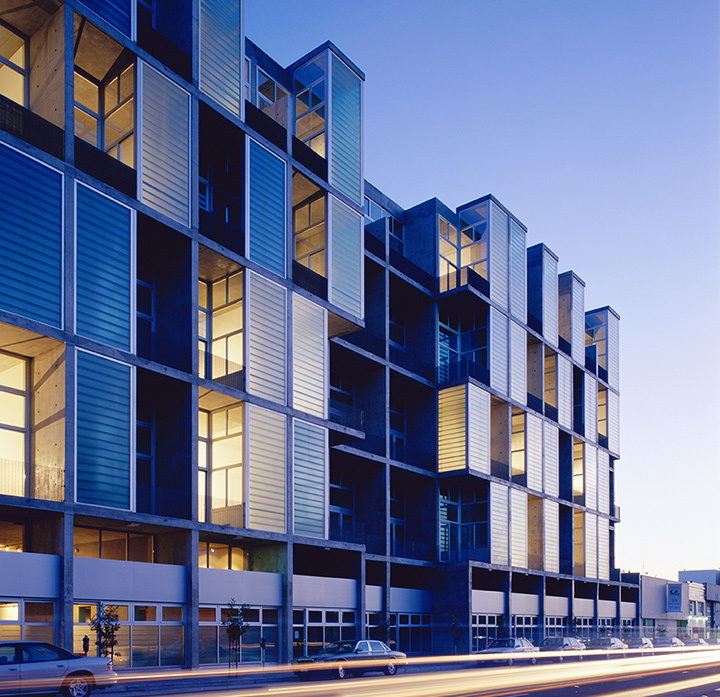 This design language of concrete and glass references the vernacular of the SOMA neighborhood, which up until recently has been filled only with warehouses, car repair shops and factory buildings. Apartment interior, as shown during staging. View of alternating use of glass. Living at Yerba Buena Lofts will be a lesson on maximizing space. This is a loft, so the lower level has an open floor plan with multiple areas and 17′ high ceilings creating a sense of spaciousness. There is a space which can be configured as living room, office, dining room yoga studio, you name it! A kitchen and guest bathroom are placed near the entrance, thereby maximizing the living area. The upstairs has a small bedroom and large walk through closet. My design goal is to add warmth and softness to cut the hard materials, create a cooks kitchen, max out storage, provide moments of intimacy and privacy, and vary the types of space to suit my different needs: an office, a guest bedroom for Richard and Luc and other friends, and an intimate reading area. 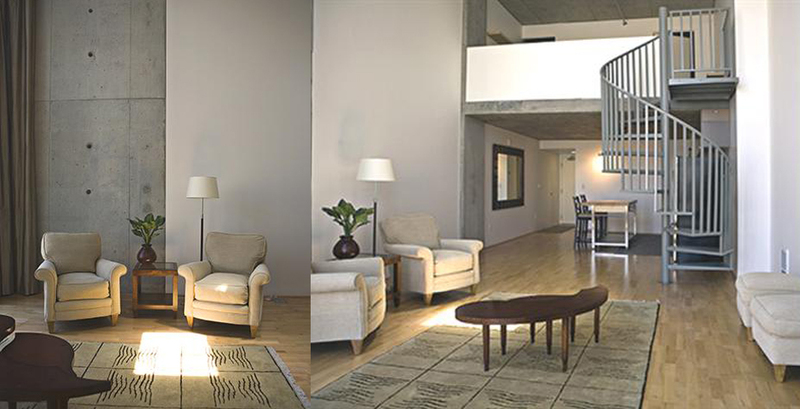 Do you like the design of Yerba Buena Lofts? Are you having any difficulty downloading this blog on your phone or computer? Let me know your thoughts and comments. Staged view from living area towards kitchen and upstairs bedroom.